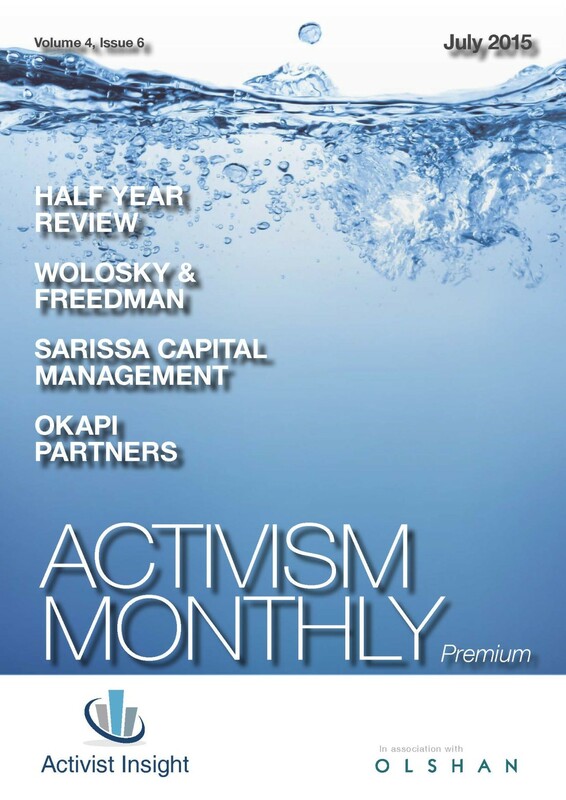 Activist Insight, publisher of Activism Monthly, announced that it has issued its Half-Year Review 2015, in association with Olshan’s Activist & Equity Investment Practice. The review highlights major trends in shareholder activism, reveals statistics on activist campaigns during the 2015 proxy season, features interviews with key players in the shareholder activism space and offers predictions for the remainder of the year and into 2016. Steve Wolosky and Andrew Freedman contributed expert analyses to the review in both a foreword and interview with Activist Insight’s Josh Black. They claim 2015 has proven to be every bit as eventful for shareholder activism as 2014 and predict new activist investors will continue to emerge as money flows into the space. One key statistic from the review finds that the number of companies publicly subjected to activist demands globally rose to 300 in the first half of 2015, a 23% increase on the same period a year earlier, according to data gathered by Activist Insight. To date in 2015, Olshan has already advised on 46 activist campaigns, delivered 40+ nomination letters, negotiated 30 settlements, and has helped clients get board seats at 34 public companies. To read the Half-Year Review, please click here.